It is instructive to review and analyse the issues that Keane cites in his autobiography that made him decide to walk out of the 2002 World Cup in Japan and South Korea. The Irish squad arrived in Saipan on Saturday afternoon 18 May 2002. Within 72 hours Manchester United's Roy Keane had "...had enough. "[Page 259]. So what had happened to cause Keane to come to this momentous decision? To this day Keane constantly tries to focus on the 'faking injury' accusation that he says Mick McCarthy made as the reason why he couldn't take part in the World Cup. Keane continues to beat this drum despite the fact that no-one else at the Irish team meeting in the Hyatt Regency hotel seems to have heard McCarthy make this accusation. Jason McAteer and Matt Holland contributed to newspaper columns around the time of Keane's Saipan tirade and neither reported that McCarthy had accused Keane of faking injury. Niall Quinn's version of the events in Saipan does not include any mention of 'faking injury' either. Certainly McCarthy's detailed account of events that evening do not include any reference to it. It would appear that Keane's constant references to this non-accusation are meant to deflect from the fact that Roy Keane had decided that he wanted to leave Saipan before that Irish squad meeting and even before his interviews with Tom Humphries and Paul Kimmage. So, according to Keane, what was so wrong with the Irish football team set up ahead of the 2002 World Cup Finals. "The trip is a shambles from the start. Dublin Airport is packed." Anyone that has passed through Dublin airport at any time around 2002 will testify that it was always a shambles. This is an issue to raise with the Dublin Airport Authority. Neither the FAI nor Mick McCarthy can be blamed for this. "We hump a month's luggage through the main concourse. Check ourselves in." For security reasons each passenger must check himself / herself in and must account for the security and contents of his/her own luggage. It may not have been possible for the FAI to do the check-in for the players. It is not reasonable to expect fit and young professional athletes to look after their own luggage. In the Roy Keane video, As I See It, the Manchester United players including Keane can been seen checking in and carrying their own luggage for an overseas trip. That doesn't seem to have been a problem for Keane. During the Amsterdam transfer at Schipol airport Roy Keane spotted a couple of journalists that "wrote the 'Keane Snubs Kids' stuff" in relation to Keane's no-show for Niall Quinn's testimonial match. Words were exchanged. Once again it's difficult to see how this was the fault of McCarthy or the FAI. In fact in his World Cup Diary [Page 148] McCarthy comments about Keane and the exchange, "Fair play to him" for having a go at the journalists. On the Saturday (Keane seems to suggest that it was the Sunday) evening over dinner Mick McCarthy announced that the training gear, footballs, medical equipment, and special drinks, hadn't arrived yet. He also told the players that the condition of the training pitch was not up to the standard that he had been promised. 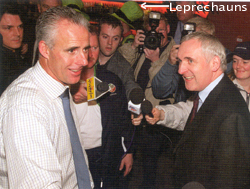 Later that evening Keane visited McCarthy in his hotel room to make his unhappiness with the situation clear to McCarthy. The training gear arrived in time for Monday's training session so the lack of gear actually only impinged upon one full training session. Keane was right to complain but the lack of equipment for one day was not that significant. This was confirmed in the Genesis Report, "... the late arrival of the skips of gear had little impact on the team." Keane described the training pitch as being "...like concrete, pot-holed with loads of loose stones lying around." Given his track record with injuries he was rightfully concerned for his safety. On the Tuesday he described the pitch as partially flooded and partially rock hard. Even Mick McCarthy admitted that the pitch was way below the standard that he had been promised. According to McCarthy he picked Saipan as the venue for light training, relaxation and squad bonding. The serious pre-tournament training would take place in Izumo in Japan where the facilities were top class. McCarthy said in his World Cup Diary [Page 161] that he also picked Saipan because of the widespread popularity of Manchester United in the Far East. For the period of time spent in Saipan Ireland's captain could acclimatise to the heat but he would be spared the unwanted attentions of autograph hunters and fans. Following a training session on the Tuesday they players ended with a practice game. The goalkeepers had been training separately from the outfield players and had started their training a half hour earlier than the other players. Roy Keane wanted the goalkeepers to take part in the end-of-training game but the coach, Alan Evans, insisted that the keepers were too tired. After the game Keane challenged goalkeeping coach Packie Bonner and goalkeeper Alan Kelly. They had a heated row and Keane and Kelly squared off against each other. Later Kelly and Keane spoke and patched up their differences. Packie Bonner categorised the row with Keane as not as bad as rows that he had had with his kids over homework. On one hand Keane was dismissive of the significance of the row himself; "...if I was to fall out with everyone I'd had an argument with, I'd be talking to nobody." [Page 262]. On the other hand it seems to have been the last straw for Keane. "By the time I got back to the hotel I'd had enough. This wasn't for me." After a taking a shower to cool down Keane met with Mick McCarthy and announced that he was going home. Clearly the problems with the training pitch were real and significant. McCarthy had been assured by the by the authorities of the Commonwealth of the Northern Mariana Islands that the pitch at Oleai Field would be upgraded. It was reported later in the Saipan Times that $20,000 had been spent on improvements. McCarthy and / or the FAI are culpable for not not checking on the state of the pitch in advance of the arrival of the Irish football team. However, according to McCarthy's World Cup Diary [Page 152], he chose Saipan to build a foundation for the more intense training at the state of the art facilities in Izumo in Japan. Keane was aware that the serious training would begin in Izumo. McCarthy said that the Pacific island was chosen for the purposes of acclimatisation to the heat and humidity, and for light training. Ray Treacy, former international and the man who made the Irish World Cup travel arrangement, confirmed that Saipan was chosen for acclimatisation purposes and because the more famous players such as Roy Keane would not be mobbed by fans. The airport check-in, the row with the journalists in Schipol, the training gear arriving late, the row over the goalkeepers for a training match were either relatively insignificant or not the fault of Mick McCarthy or the FAI. Clearly a mistake was made over the pitch but as Keane's own autobiography amply demonstrates Keane's career is littered with mistakes on and off the field. Twelve red cards and numerous late night brawls and scrapes with the police are testament to that. When taken in the round it is difficult to understand how the small list of issues that Roy Keane outlined in his autobiography could have brought him to the point that he felt that he "had enough". Not one other player in the Irish soccer squad came to the same conclusion, including players that had been involved with the Irish soccer set up for a longer period than Keane. As we were to find out during Keane's tirade during the Irish team meeting none of these were germane to the real issue which was - Roy Keane's complete and utter disdain for Mick McCarthy.